Barkhaven, Missouri, November 7, 2018 -- The world's oldest person, Eleanor Micklebuckle, 129, of Elkhart, Illinois, confirmed that she was "not yet dead" when reached at her home today via telegram. Ms. Micklebuckle, a retired plutonium finisher who credits "rubdowns, barley and electricity" for her exceptional longevity, said, "I still have a lot of appreciation for the many good things in life, even though I can't hear, see or smell them too good anymore. Thanks for checking in." Wakka Wakka, Texas, June 30, 2019 -- Astrological aficionados born in the months of April and May were briefly shocked yesterday to read a chilling prediction posted in the Dallas/Ft.Worth Rancher's Almanac. 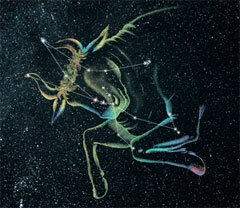 The horoscope entry, which according to horoscope specialists was an unusually categorical example of the genre, read, simply, "Taurus: You die today." Rome, Italy February 12, 2006 -- The new catechism of Roman Catholic doctrine that did away with Limbo and was approved by Pope Benedict XVI in the middle of December 2005 threw the state of Limbo into a state of chaos. This catechism changing the eternal residence for those souls included in both the Limbo of the Fathers (limbus partum) and Limbo of Children (limbus infantium) by moving them straight to Heaven has left many souls wondering what happened and why. Tampa, FL, June 30, 2008 -- The small and solemn multitude is clad in traditional blacks and grays, the voices muted, the music played at low volume and in a minor key. But two key factors set this familiar scene apart: enlivening each mourner's respectfully dreary attire is a brightly colored ring of tropical flowers; and the service is taking place on a wharf overlooked by the imposing bulk of one of the world's largest container ships, the 314-meter goliath Thanatos. Washington, D.C., December 3, 2005 -- Chief Justice of the United States William H. Rehnquist died yesterday evening in an incident unrelated to the many life-threatening illnesses that plagued his last years of life. Chief Justice Rehnquist served as an Associate Justice of the Supreme Court from 1972, when nominated by President Nixon, until 1986, when he assumed the post of Chief Justice following President Reagan's nomination. Rehnquist will continue to serve posthumously, a move those familiar with judicial praxis describe as "highly unusual".